Moscow-based Wheely is a taxi service operating in several cities in Russia as well as in London. The company needed to increase its pool of drivers to see higher revenue. After attempting to achieve this with a new landing page, they were unsuccessful. They called us for help. This case study explains why the landing page failed to work initially and how we tested two new designs to fix the problem. However, despite the effort and the money spent, an expected boom in calls from the the landing page visitors was not observed. Unsatisfied with the results, Wheely decided to contact Vertising for help. What was putting a spoke in the wheels of Wheely’s landing page? Why wasn’t it working well? We studied the target audience of the project thoroughly and created a profile of a potential Wheely driver. The landing page was overloaded with excessive details. The registration form had 6 fields that were hard for users to complete (e.g. Some users could not remember their email addresses). Unexpected difficulties is what makes leads go away and never come back. A how-to block of the landing page did not give a clear message about the way the job assignments are put together and the time you need to spend in order to register in the system. The advantages were presented in a good way but didn’t address some of the expectations of the target group. In other words it didn’t have a grip on the audience. The reviews were the same for all the regions from which the users were browsing the landing page. It was no wonder that the information in some reviews didn’t correspond to life realities of some users. In order to calculate the level of future income, users had to follow a number of steps, and some users didn’t understand that so they were unwilling to register as a taxi driver. We found out that it was a real puzzler for a user to understand the way of partnering with Wheely as a taxi driver. 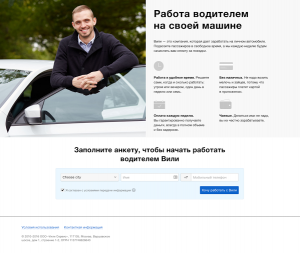 The registration as a taxi driver at a landing page seemed to be a very timeconsuming procedure, and potential taxi drivers were not excited about it. 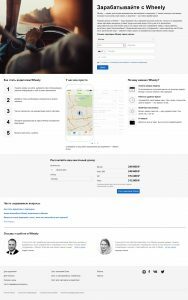 While fashioning the redesign we had to take into account the problems that we found in the current version of Wheely’s landing page. Our marketing experiment was based on 2 versions of the same landing page. For A/B testing of Wheely’s landing page we created 2 new design versions. simplified the registration form and included only 3 fields in it (“city” (chosen from the list), “name” and cell phone). In the simple version of the landing page we retained only the benefits of working with Wheely and a short registration form with 3 fields. We decided to run an A/B test to find out which design version would have the highest conversion rate. Our A/B testing ran for 10 days (from May 23 to June 1), and the results exceeded our expectations. The 1st version of the landing page showed an increase in the conversion rate up to 27.6% compared to the old version, as expected. However, the results for the 2nd version caught us by surprise. The conversion rate grew up to 70%! Why was the second version so much more successful? The explanation is this simple: when creating the design of the 2nd version we kept in mind the preferences of the target group – to prefer to receive the information offline in a real-life conversation (by phone or in person) rather than read the full website page. 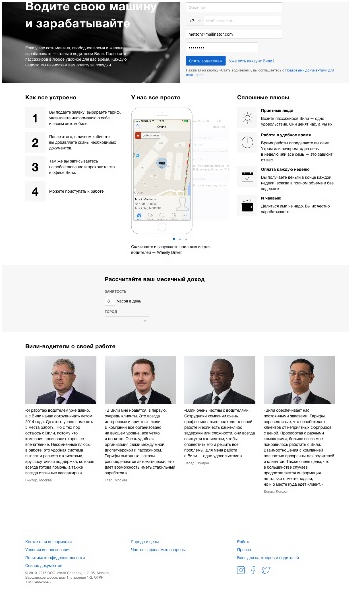 No doubt that the 2nd version of the design will soon be chosen as a main version of the landing page. Now we are continuing our experiment by keeping track of the statistics, and we are ready to share the conversion rate ups and downs with you in the comments. Test your updates in a professional way. Vertising has raised the conversion rate for Wheely without having to reinvent the wheel. We will be happy to let our case study inspire you to perform an excellent A/B test on your landing page.